29133b. 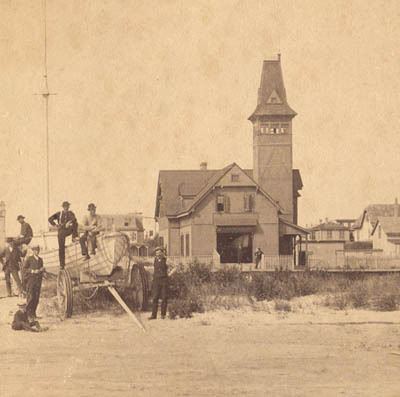 (stereoview) Atlantic City Life Saving Station with crew and Absecon Lighthouse, Atlantic City, N. J. c.1890 by S. R. Fisher Photographer, Norristown, Pa. . This unusual clear, close view shows the Life-Saving Service crewmen posing on the beach with their surfboat and carriage. In addition, this unusually detailed image includes good view of the 1884 Deal-type Life-Saving Service station with other boats inside, as well as the drill tower, the lighthouse, keeper’s house and adjacent buildings. Oversize view provides good detail, clear with great toning. Overall clean, light foxing and edge wear. (VG). $94. We are continually acquiring wonderful and rare original books, documents, antiques and implements. Below are photos and information. Inquiries welcomed. 11315. 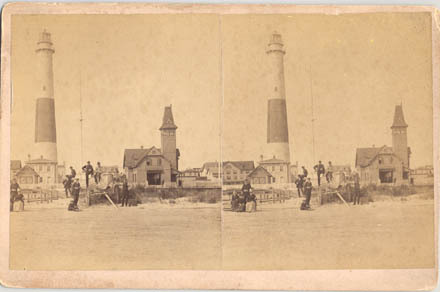 (cabinet photo) Absecon Lighthouse, Atlantic City, NJ. c.1880. 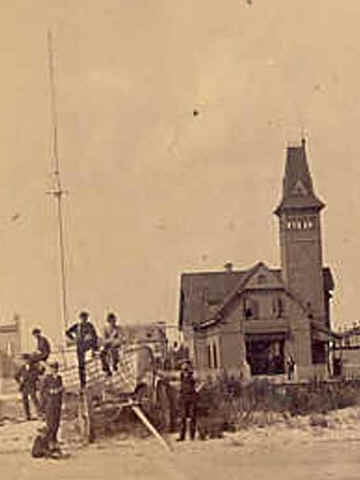 Fine early view of the tall Absecon light tower with the U.S. Life-Saving station behind. This professional view measures 4 ¼” x 6 ½” and is clear and close, a few marks or spots. (VG). $78. 12187. 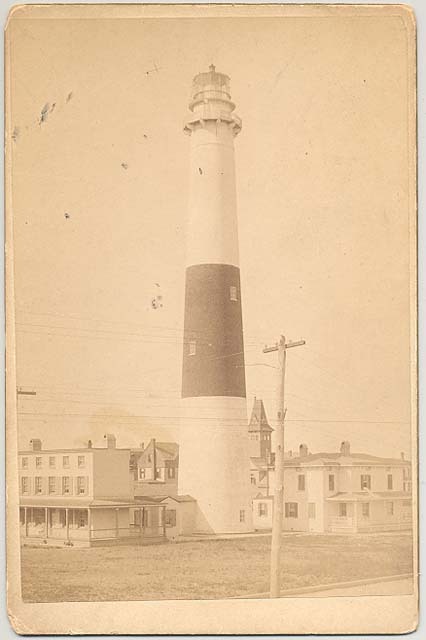 (photo) Absecon Lighthouse IOV lamp, Atlantic City, NJ c.1900. 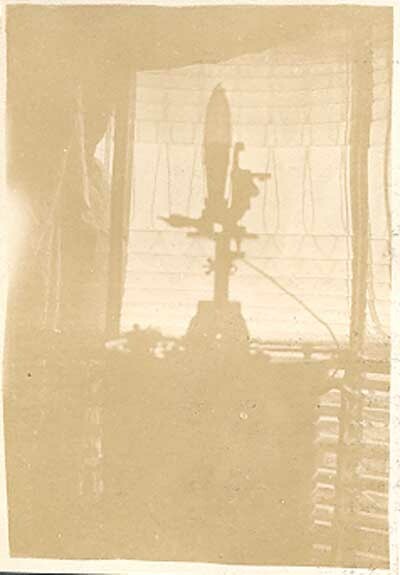 Rare image taken by a lighthouse visitor shows the 55mm IOV lamp inside the large 1st Order Fresnel lens. A most unusual view as it was extremely difficult to take interior photographs at the time. Image includes tank, burner and mantle as well as segments of the lens and the curtain (pulled back) from inside the lens ! Photo measures 2 ½” x 3 ½” and is mounted to portion of album page. A bit light but still some detail. (VG). $45. 21289. [Life-Saving Station, New Jersey] THE NEWBURGH REGISTER ALMANAC FOR 1881. H. P. Kimber & Co., Newburgh, NY. 1880. 44p. Soft wraps. Typical almanac of the day includes all forms of date and astrological information. Of particular interest are the wonderful full page engraved views of scenery across the country and particularly a half-page view of an extremely early life-saving station on the New Jersey coast. With the engraving is a half-page article describing this new service, its evolution from the Massachusetts Humane Society, staffing and more. A wonderful early view, the first I have ever seen of this style station. Clean, crisp, unusually good condition. (F-). $46. 1160. na. 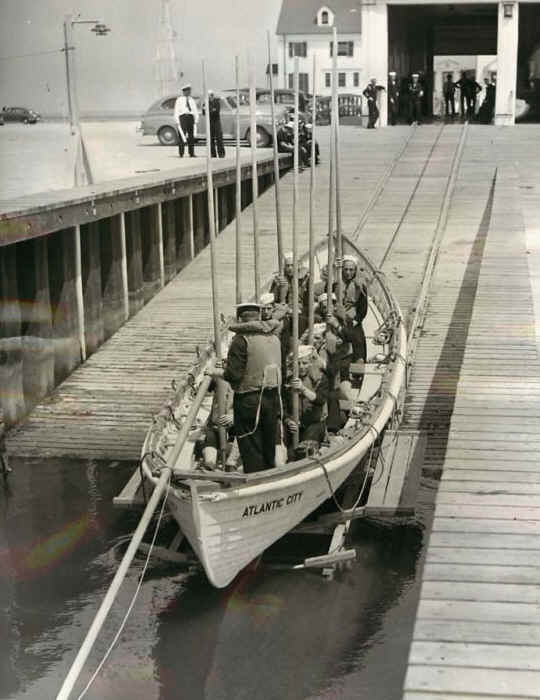 He Flung the First Life Line – The Story of William A. Newell, of New Jersey, Founder of the United States Life Saving Service – A Career of Practical Philanthropy. The Christian Herald and Sign of Our Times. April 5, 1899. 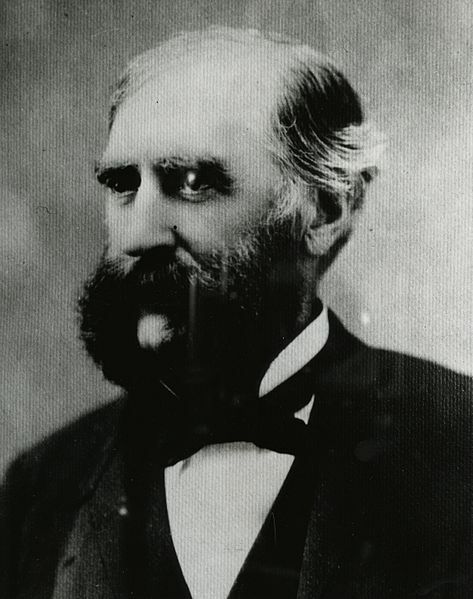 After witnessing a shipwreck on the coast of Long Beach Island and the loss of all thirteen lives in 1839, William A. Newell was prompted as a Congressman in 1848 to appeal for funds to establish a federal life-saving system. Throughout his career he championed this cause and helped to build one of the best life-saving services in the world. Excellent account of his early work in this area. One page article with engraved illustration of Mr. Newell. Full issue with numerous other articles of the day. (VG). $28. 29207. [Victorian commemorative covered Mauchlineware box] c.1900. 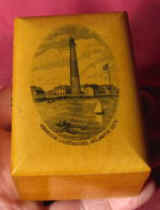 Superb, rare wooden Victorian covered box features a beautiful b/w lithograph of the “Absecon Lighthouse, Atlantic City”. 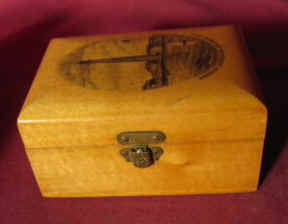 A pretty piece, the box is of hardwood, varnished and measures 3 3/8” x 2 3/8” x 1 ¾” h. The pretty image measures about 2 ½” oval and shows the tall light tower with attached keeper’s dwellings and adjacent buildings. The box has a nicely hinges cover with a brass latch. Such wooden Victorian era commemorative pieces, known as Mauchlineware, are exceptionally difficult to find and are quite pretty for display. Clean, little if any wear, only one slight mark on cover. Most Rare! (VG+). $118. 1117. 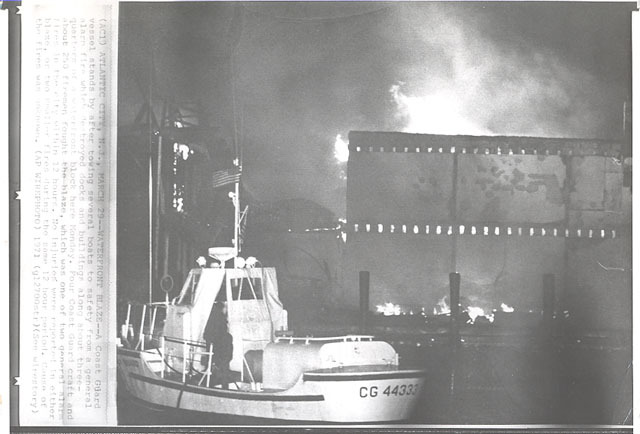 (press photo) CG 44333 (Atlantic City) standing by after towing several boats to safety from a general alarm fire which destroyed docks and buildings along about three-quarters of the waterfront block. March 29, 1971. 6” x 7”. b/w. Photo is b/w and includes date and credit line on back. Clear and close view. (VG). $28. 29133. 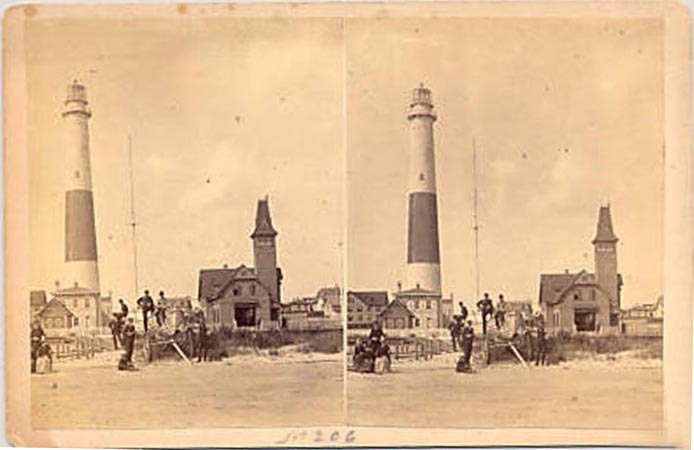 (stereoview) Atlantic City Life Saving Station with crew and Absecon Lighthouse, Atlantic City, N. J. c.1890 by S. R. Fisher Photographer, Norristown, Pa. . This unusual clear, close view shows the Life-Saving Service crewmen posing on the beach with their surfboat and carriage. In addition, this unusually detailed image includes good view of the 1884 Deal-type Life-Saving Service station with other boats inside, as well as the drill tower, the lighthouse, keeper’s house and adjacent buildings. Oversize view provides good detail, clear with great toning. Overall clean, light occasional foxing. (VG). $110. 29144. 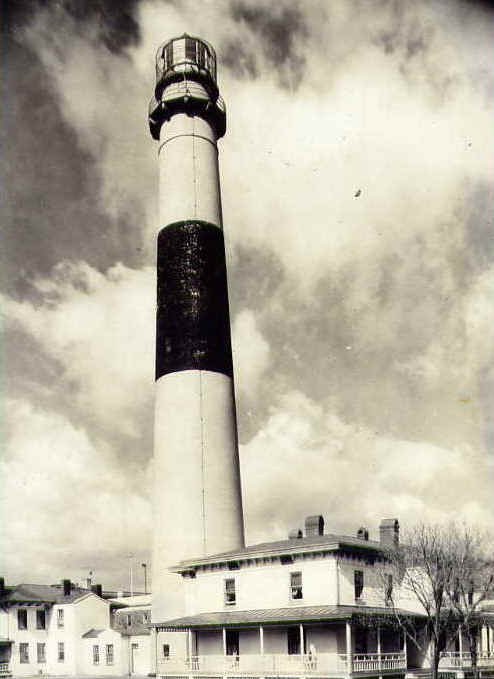 (news photo) Absecon Lighthouse, Atlantic City, N. J. c.1936 by International News Photos. This unusual clear, close view shows the tall light tower with attached keeper’s dwellings and adjacent buildings. Includes news caption noting that the light tower is being offered for sale by the Government, and date on back. Unusually close view provides great detail, clear with great toning. Overall clean, crisp. (VG+). $38. 2736. (photo) “The Only Remaining Remnant of the Ill-Fated Akron”. April 4, 1933. Wide World News Photo. 7” x 9” b/w. 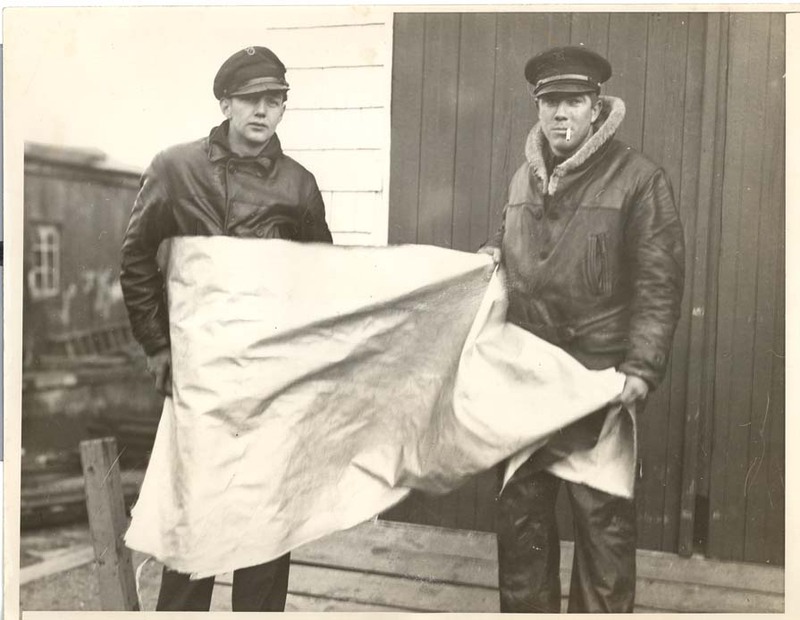 From the credit line on obverse: “Photo shows left to right William Lewis and Mel Cramer of the Coast Guard station at Atlantic City, holding a piece of the fabric of the ill-fated dirigible Akron, the only remnant of the air-ship found thus far, which picked up 20 miles off Beach Haven , N.J. Rare view. (VG+). $34. All text and illustrations on web site Ó James W. Claflin . 09/17/2015 All rights reserved. Use prohibited without written permission.